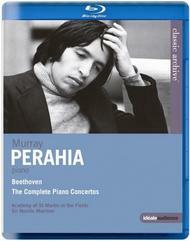 Murray Perahia, winner of the Grammy Award in 1989, 1999 and 2003, is often described as an aristocrat of a piano. He performs Beethoven's piano concertos 1-5 with eloquent phrasing, beautiful tone and poetic sensitivity, that became a trademark of this extraordinary pianist. Beautifully restored, using the finest state-of-the-art technology, Classic Archive features great performances by legendary artists and offers a unique historical glimpse into classical heritage. Perahia�s Beethoven thus, with its formal balance, crystalline textures, eloquent phrasing, unfailingly beautiful tone and spacious grasp of large-scale structure, allows us to eavesdrop on the development of a towering genius as he ushers in the birth of an era.